A dental implant placement is a surgical procedure which involves the replacement of a tooth’s root due to damage. Tooth implants are inserted and secured surgically in to the jaw bone. These implants at our Burlington dental office are barely noticeable once secured. Dental implants are utilized to secure crowns or bridges which replace missing teeth; additionally, they can also secure dentures for improved retention and minimize movements during regular functions like eating and speaking. 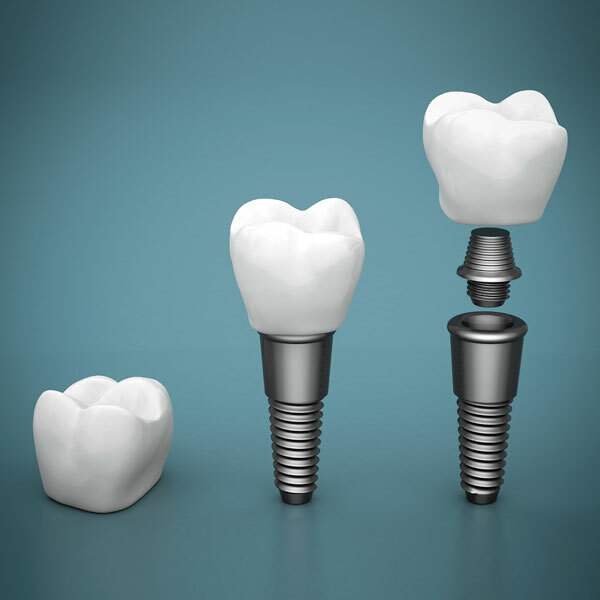 Dental implants are produced using titanium, a safe metal utilized as a part of numerous dental products. Generally, our body tolerates this type of metal well and this results in a high success rate for implanted surgical placements. When a tooth implant is put into the jawbone, it will integrate in to the bone. This is the most practical you can get without placing a natural tooth in the mouth. The advantage of this method is that the implant is stable enough to function on its own without affecting any neighbouring teeth. There are many advantages to getting tooth implants such as improved appearance, which can lead to higher self-esteem, improved speech, chewing comfortably, durability, convenience, and overall improved oral health. At Fairwood Dental we make sure that each patient has an individual plan developed for them as everyone’s mouth and teeth are different; the plan would target the patient’s specific need for dental implants. The surgeon can start by placing the implant into the bone socket where the natural tooth was extracted or prepare a socket for the implant if the tooth has been extracted before. While the implant is given time to bond with the bone a healing cap is usually placed on it. The healing process is approximately 12 weeks depending on the patient and the implant. There is usually little discomfort for when the procedure is completed, local or General anesthesia can be used on the patient during the procedure and patients are usually instructed to take over the counter medications such as Advil and Tylenol or prescribed medications to help with the discomfort afterwards. Please call our Burlington office for more information about dental implants. The information provided is for general information purposes only and not intended to replace professional care. Please consult your physician or dentist for advice and diagnosis so you can be properly treated for your specific situation. Thursday: 9:00 a.m. - 3:00 p.m.